The last Friday of every month, my team does a gluttonous but delicious Breakfast Potluck. With 15 people on the team bringing in all types of goodies, you can imagine what kind of extensive spread we have. Sure, some may think it’s not so productive to gorge ourselves so early in the morning. And yes, I’m usually in a food coma for the better part of the day—but it’s just so darn tasty. 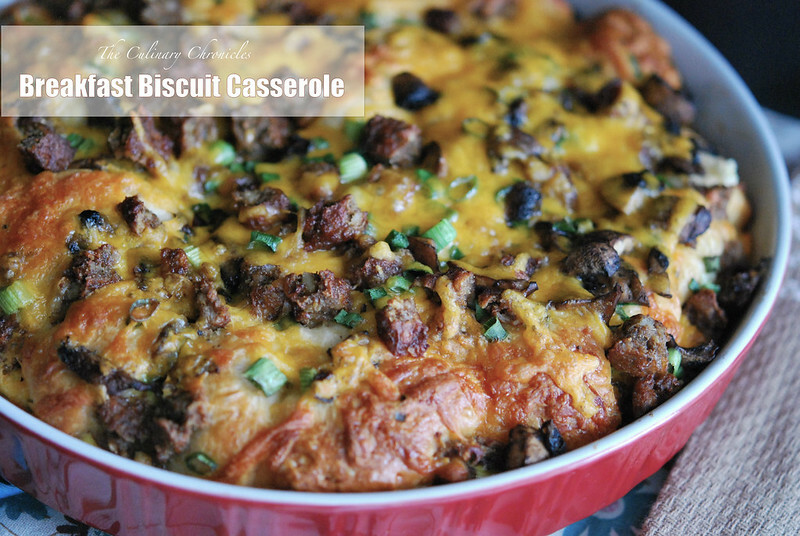 At our last go around, I decided to make an easy but hearty breakfast casserole— a Breakfast Biscuit Casserole to be exact. And you want to know my shortcut? I use a can of ready-to-bake biscuits. Yup, the same type you use in monkey bread—–mmmmm, monkey bread. The end results in something fluffy, eggy, cheesy and just plain über delish! The prep time is nothing at all and by the time your morning coffee is ready, you’ll have the casserole in the oven. In a skillet, heat the vegetable oil to medium and add the breakfast sausage. Use a wooden spoon to crumble the sausage and break into small pieces. Cook the sausage until browned and transfer to a plate. Add the mushrooms to the skillet and cook until just tender. Transfer to the plate with the sausage. In a bowl, whisk together the eggs, milk, and parmesan cheese. Season with salt and pepper. Take each biscuit and cut them into quarters. Grease a 10-inch casserole dish with cooking spray. Spread the biscuit pieces evenly in a single layer on the bottom of the dish. Pour the egg mixture over the biscuits and sprinkle the sausage and mushrooms over the top. 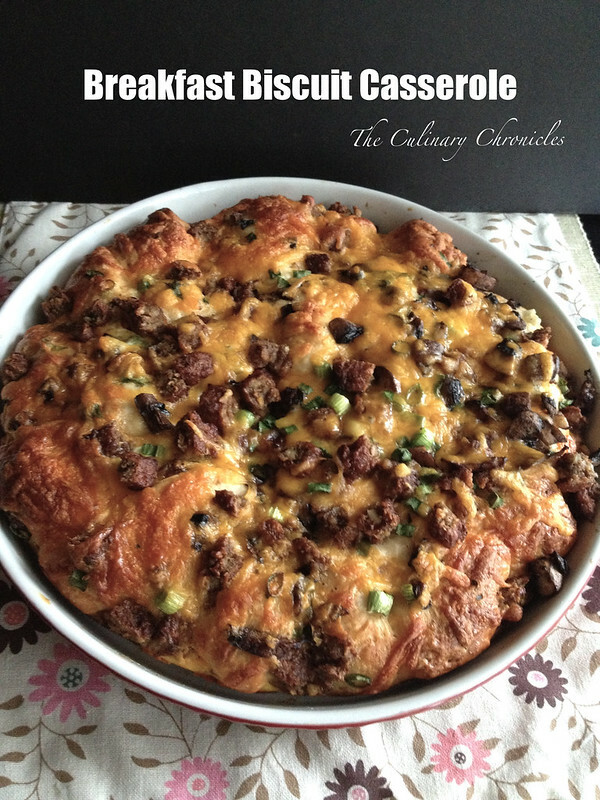 Top the casserole with the cheese and scallions. Bake for 35-40 minutes or until golden brown. Serve warm. Previous Post Pomegranate Mojitos – A Super Cocktail! Next Post Japanese themed Family Dinner and Lychee Saketinis! Kampai! This was so delicious! I can’t wait to make it myself! Fantastic pictures. It looks so good! 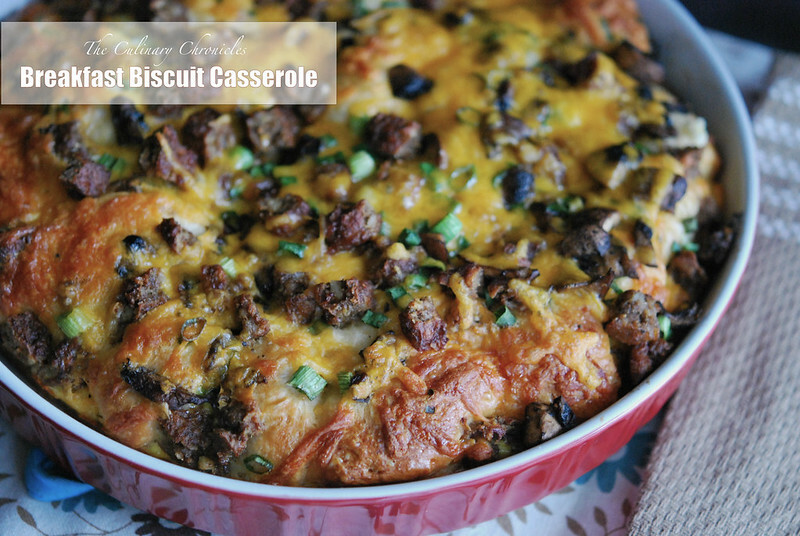 This breakfast biscuit casserole looks good for any meal – regardless of time of day! The mushrooms, sausage, and savory cheddar cheese sound amazing together. We recommend trying Sargento Deli Style Sliced Chipotle Cheddar Cheese with this recipe. The combination of chipotle peppers with our all-natural Cheddar cheese would add a fun and smokey kick to this casserole. I could sure wake up to this every morning!